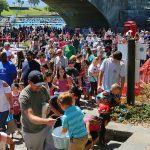 Now a household name for summer family vacations, spring break getaways and a retirement hot spot, Lake Havasu was first appreciated by a small fishing and boating community. It was 1956 in Los Angeles, Calif., when young entrepreneur Robert McCulloch was in the midst of research and development for his recently purchased company, Scott Atwater. 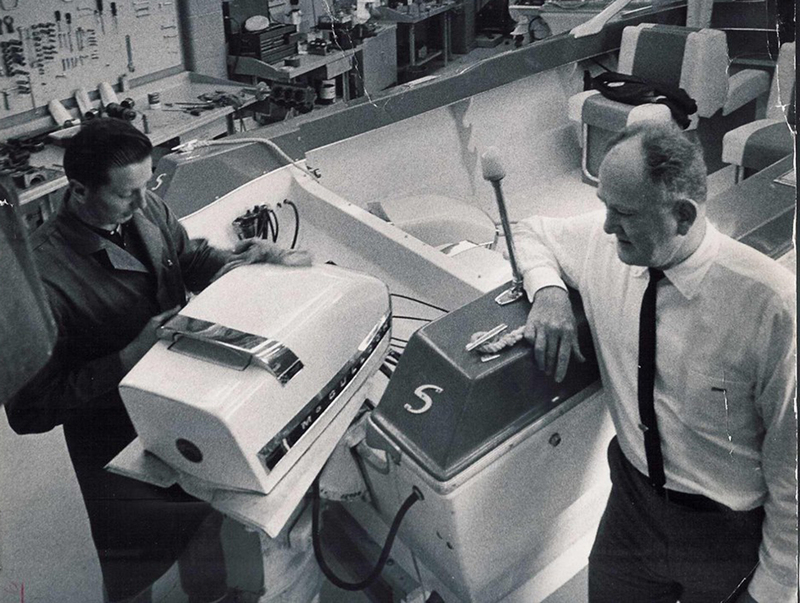 The main purpose of the company was the manufacturing of outboard motor systems for pleasure boats and extending into the racing class of boats. The engines that McCulloch was testing were all outboard type engines that consisted of a power-head, tower housing and a lower unit with the propeller attached, which hung off the transom of the boat. In today’s boat engine marketplace there are four primary configurations of boat engines and drives, with the Outboard and the Inboard/Outboard being the most popular engines and drive configurations. At the time of the Site 6 Test Center’s primary operation – in 1959-1965 – the McCulloch engines tested were from 7 ½ through 75 horsepower. In 1957 and 1958, McCulloch was looking for a new location for his operation to combat the rising costs of the metropolitan LA area. He had heard of a quaint desert resort in Arizona known as Site Six. Initially, Site Six, still present today on “the island” was used as a rest and recreation location for the Army Air Corps in World War II. Barracks, docks and a mess hall were built to house soldiers on a one-week leave from military duty. At the end of the war, Corrine and Vic Spratt changed the personality of the location into Spratt’s Fly-in Fishing Resort. Vacationers of the time flew in for day and weekend trips to camp, fish and get away from the hustle and bustle. Notable visitors of the time included actor Robert Taylor. McCulloch envisioned Site Six as the perfect place to test his outboard motors and offered the Spratts $300,000 for the 150-acre estate. After a couple of days, the couple accepted his offer. Immediate plans began for the construction of a two-story test center and newly paved launch ramp. The original test center can be seen today at Site Six launch ramp. The first level was used for storage and mechanics and the top level included nine furnished apartments. One of the apartments was home to C.V. Woods, planner for soon-to-be Lake Havasu City and a little-known tourist attraction, Disneyland. The construction was completed in 1959. 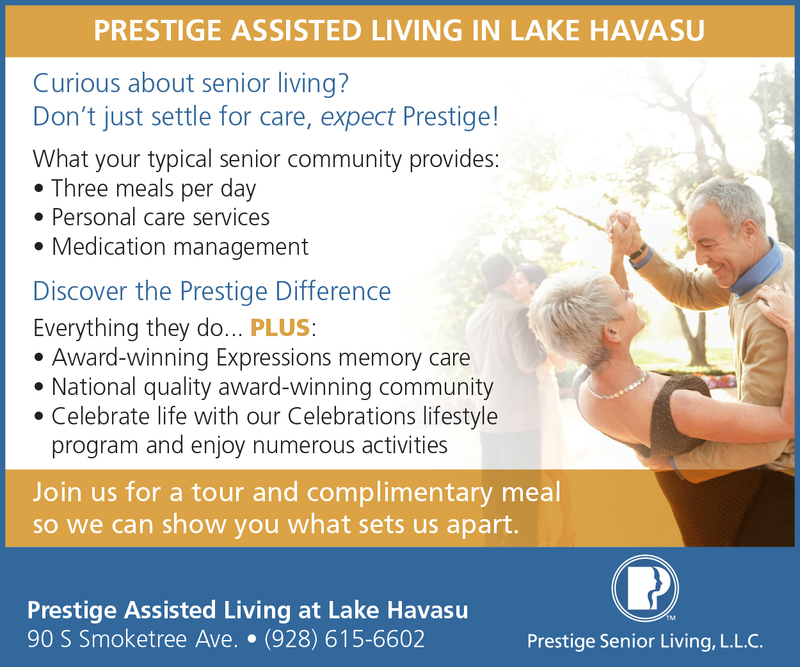 Since Lake Havasu was a solitude destination, there were no surrounding areas to pull power from for operations. Consequently, the only way to supply the center with power was by stringing a 2-inch diameter power cable from the power line on the California side of the lake. The cable was wrapped on a spool that rested on a barge. As the barge moved across the lake to Site Six, the cable was laid across the lake floor. Long-since deactivated, the cable can still be seen at the bottom of the lake as a reminder of more primitive times. Once the center was complete, testing began. 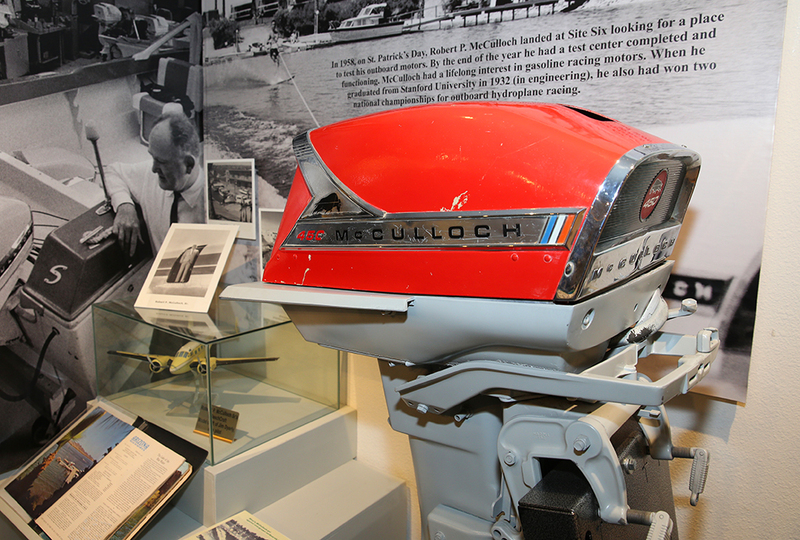 At the time, the most powerful engine that McCulloch manufactured was 45-60 horsepower. Test drivers would be assigned to the test boats and run them to their breaking point at which point they would be brought back into the test center shop for tear-down to determine what failed so corrective measures could be designed into the engines. “They would do anything they could think of to tax and break those motor engines. They would run them every day for 6 to 8 hours a day. 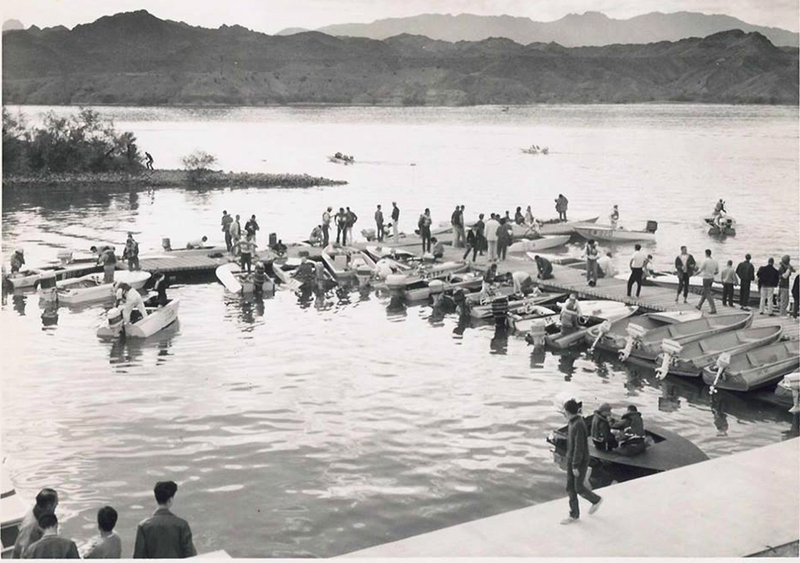 They would lay telephone poles chained together on the lake and the boats would run over the telephone poles to try to break the lower units off the engines,” said Butch Wood, Lake Havasu City Pioneer and Museum of History volunteer. 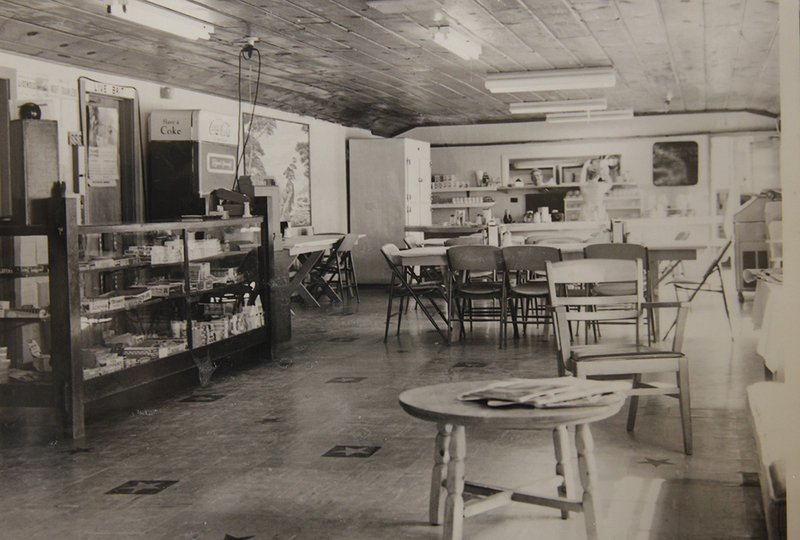 In 1960, McCulloch began to promote races at Site Six to bring an eye to Lake Havasu. 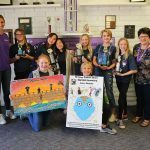 Soon after, he gained sponsorship for the event by the Western Outboard Association and the National Outboard Association. In 1964, the American Powerboat Association became the official sanctioning body for the races. 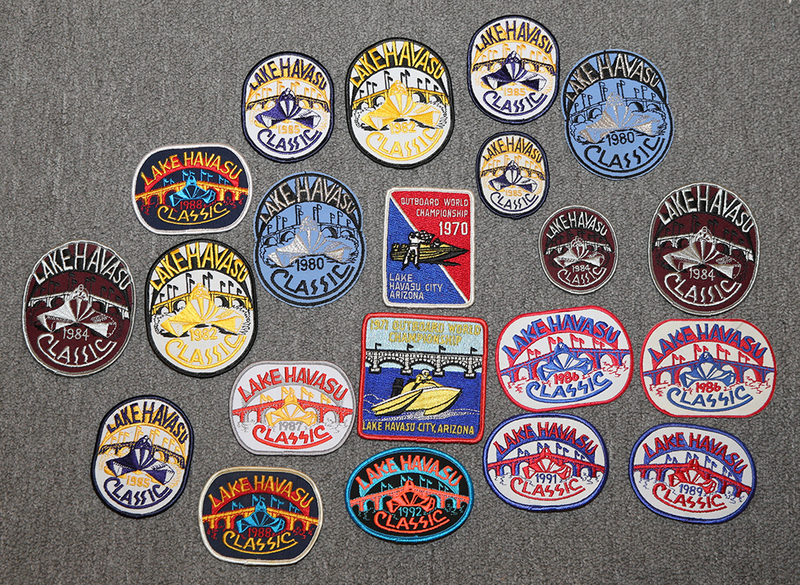 Thus, the Lake Havasu Outboard World Championships was born. Other major sponsors included Pepsi Cola and Johnson and Evinrude motors. Any racer who could afford the entry fee was welcome into the “run-what-you-brung” races. Different classes included single engine, double engine, and unlimited. The race ran from Thompson Bay in a 4-mile boomerang around Site Six, off Spectator Point. The first race in 1964 was championed by Harold “The Ice Man” Eis and his Style-Craft hull powered by a Mercury outboard motor known as “The Salty Cat.” The following year, Eis won the race again and became the king everyone was shooting for. He continued his OWC career with multiple top-10 finishes and is a prominent figure in boat racing history. That same year, history was (almost) made as the fastest man in a boat, Lee Taylor, hit the lake. Aboard his all aluminum jet boat, the Harvey Hustler, Taylor was looking to break his 267-mph record. The vessel was powered by a J-46 Turbo Turbine jet engine. 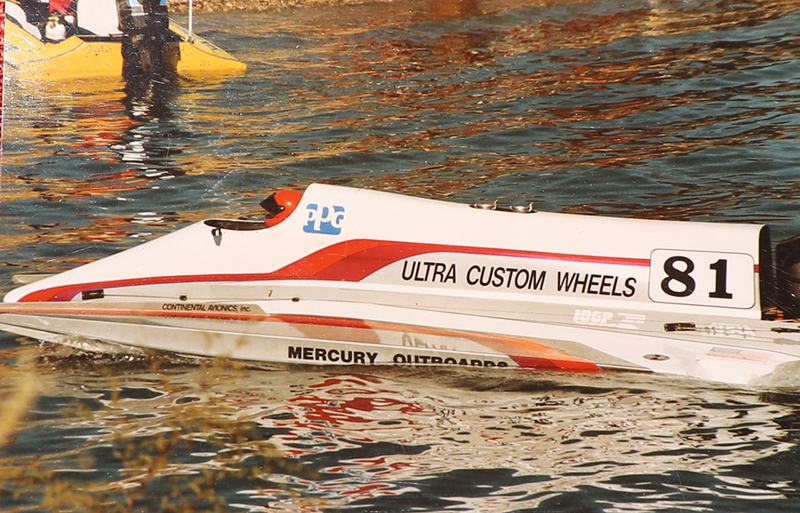 On Harvey Hustler’s final run forever, Taylor has just peaked over 300 mph when he found himself aimed straight into the Chaulk Cliff area on the California side of Lake Havasu. With visions of an accordion-style crash ahead of him, he rolled out from the cockpit and came out nearly unhurt as he rolled across the lake at 100 mph. As the rescue helicopter lifted him from the waters, the copter somehow lost power and crashed on top of the driver. Taylor barely survived. 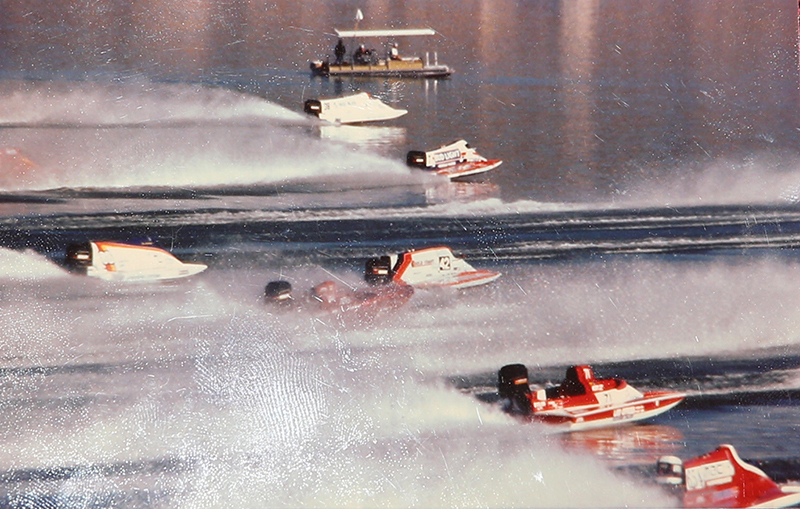 It was tales such as the crash of the Harvey Hustler that kept the name of Lake Havasu sprinkled throughout the boat racing community. As 1965 rolled in, Robert McCulloch found himself at a crossroads. 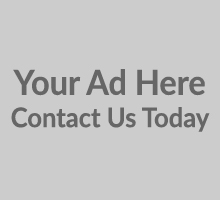 He had been diligently investing and promoting his outboard motor company, yet he had stumbled upon a land site that had the potential to grow into a thriving community. 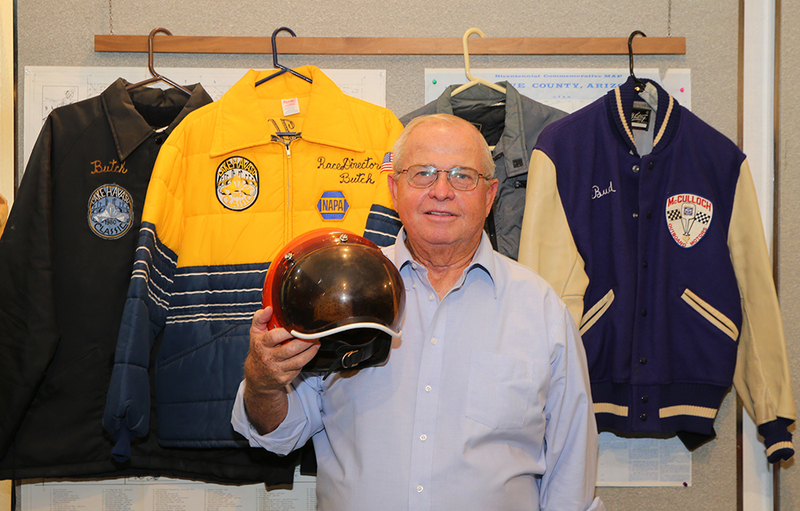 He eventually made the decision to sell his McCulloch Outboard Motor Company and concentrate his efforts in the land development of Lake Havasu City. He continued to promote the OWC races; however, the races occurred only yearly during the Thanksgiving weekend. 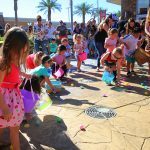 To fill in the gap times of the year and to keep notoriety in Lake Havasu, he arranged sailboat regattas in the spring that brought several hundred participants and spectators to the area and hosted celebrity tennis tournaments that brought fame to the middle-of-nowhere desert town. The races were even popular enough to hit Hollywood. Television series, “Route 66” hit the waters in 1963 as the main characters got caught in an industrial spying operation about a revolutionary new outboard motor being developed at old Site Six. 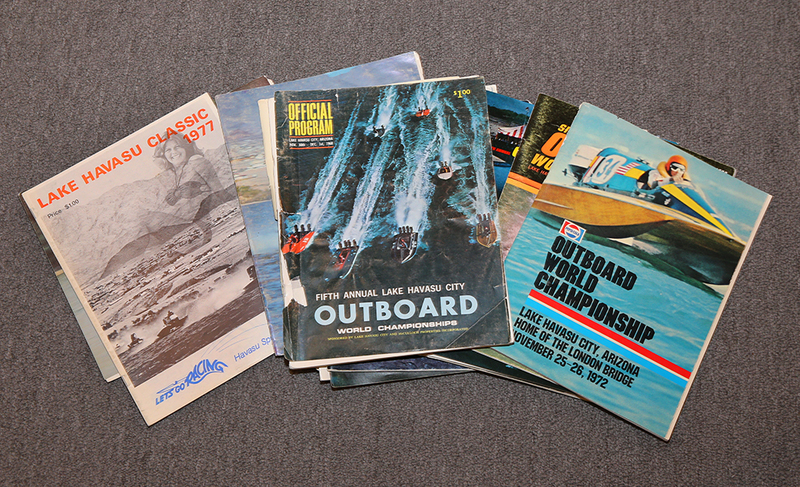 The Outboard World Championships took their final lap in 1972. Races such as the OWC pioneered many modern races today such as the International Jet Boat Association. 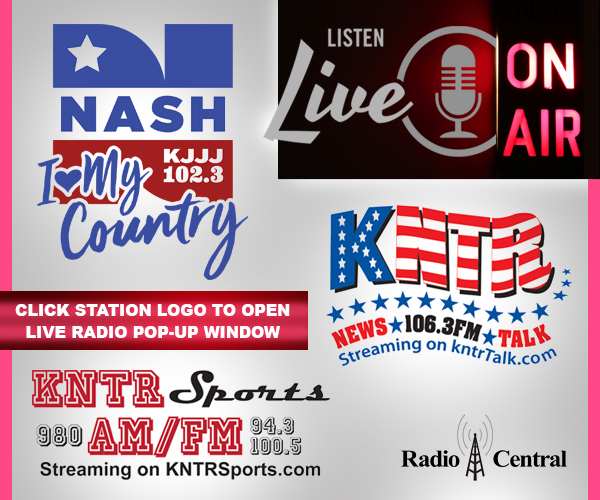 “The reason we are here is because of the boat racing that went on earlier that brought him out here looking for somewhere to test his outboard motors and that’s where McCulloch’s vision of building a community along the banks of the Colorado River came to become reality. 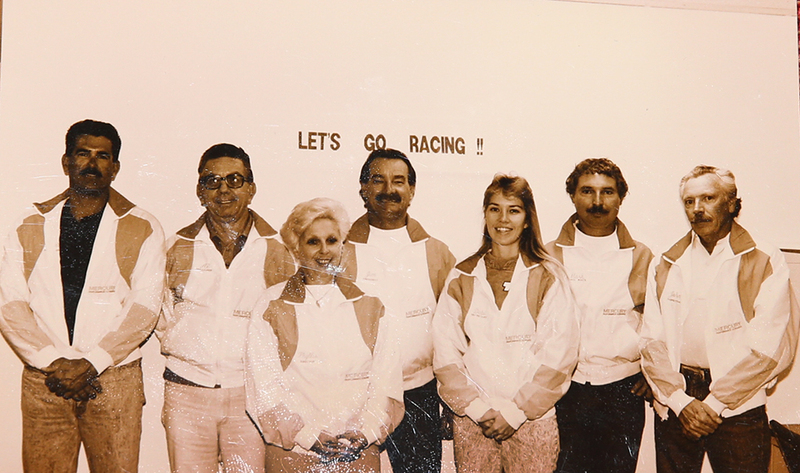 The racing is what took place during those early years to promote our area,” Wood said. Once the London Bridge was installed in 1971, McCulloch has a year-round icon to promote his community, and the rest is history. 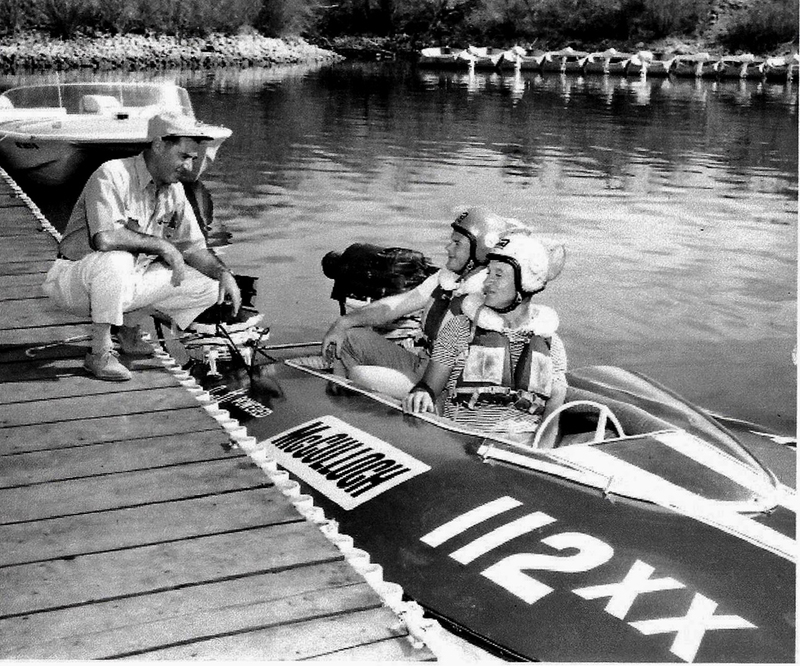 Racing photo courtesy Lake Havasu Museum of History.